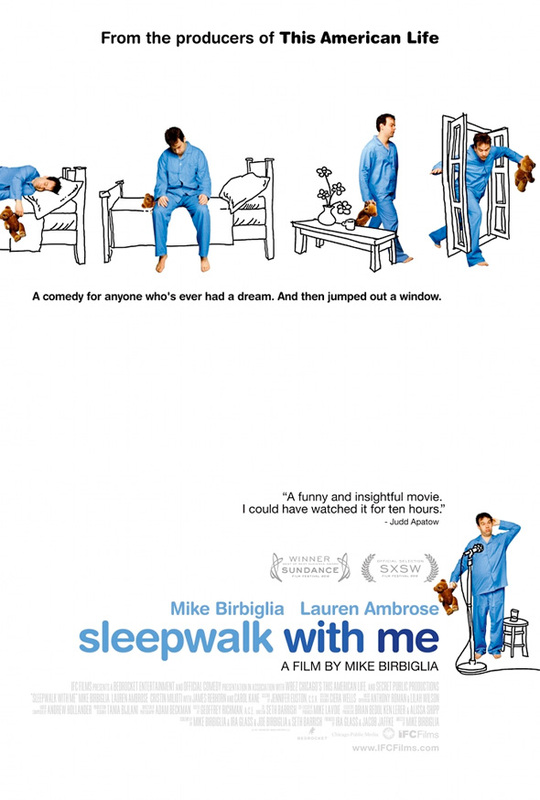 At Sundance back in January, comedian Mike Birbiglia made quite a splash with his directorial debut Sleepwalk with Me, which went on to win The Best of NEXT: Audience Award at the end of the festival. Now the film's release is just around the corner this August (expect a trailer soon), and it's time to spread the word about the funny and charming indie in which Birbiglia also stars as a struggling stand-up comedian reluctant to confront his fears of love, honesty, and growing up, not to mention a hilarious, but also dangerous, sleepwalking affliction. Read my glowing review here, and now we have the first poster too! In Sleepwalk with Me, a burgeoning stand-up comedian struggles with the stress of a stalled career, a stale relationship, and the wild spurts of severe sleepwalking he is desperate to ignore. Mike Birbiglia stars in this film which he co-directed and co-wrote with Seth Barrish (both making their big screen writing and directing debut, along with writer Ira Glass). The film premiered at the 2012 Sundance Film Festival, winning The Best of NEXT: Audience Award, and IFC Films sends the film to theaters on August 24th.